As my custom map use a few name changes to territories of both Russia and China, I’ve added the setup charts with the old names as well as the new names. So you can print what you like best. I will include a setup chart for the neutral territories (as I’ve removed the standing army number in my custom map file for Global 1940). Once again shout out what you think about them! And let me know if things can be improved. Small thing: maybe instead of M/m for Industrial Complexes use L/S? The difference right now is easy to overlook if you ask me. And Large/Small should readily translate to Major or Minor right? I’m loving this design (as you know) and will put these on my boxes (inside of the lid will be reserved for the global 1942 setup. I’m not a big fan of the reference cards as it will be quite a large stack that in my opinion doesn’t help much in terms of setup time. Although it may be useful for new players. Excellent work. Thank you for improving the game. 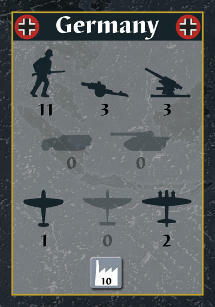 I’ve finished creating all the setup charts for both Global 1940 and 1942. See the first message for the ZIP file containing all files. This does include setup charts for the Neutral powers as well. As you can see I’ve left it as M/m as to me this is the closest visualisation to the Major / minor IC as they are called. I thought about using 10 / 3 (max number of units that can be build) to represent them but that didn’t look right next to the number of units in the other columns. Will try to fix them this asap. @8thGuards Did you by any chance also verify the 1942 setup? Or just the 1940 setup? I have an idea for something else. What about another chart about 2/3rds of the size of one of these setup charts, divided in two sectors. One sector with a unit price list, another with a mobilization zone for the purchase face. I think would be a lot better than the “fixed” price list/mobilization zone that used to be on the map (before you removed it, which I approve of). Then you could basically put it down wherever you want, depending on what power and which side of the map you’re at. That’s fine, just wanted to make sure 1942 still needs to be checked. Will do this myself. I’ve finished your corrections on 1940, but want to release all cards after checking 1942 as well before I upload them to prevent repeated manual work to combine and upload the files. I’ve been looking at a similar ‘unit stats’ and ‘mobilisation zone’ cards, but haven’t thought about combining this into one card. Will give it a try some day. @LevHunter and @8thGuards with some help of @Quirky-Turtle I’ve also corrected a few minor 1942 setups errors. I’ve update the first post of this thread with a new file that now also includes charts for the original territory names of Russia and China in case you are not using my custom map. Is this in MS Excel? If so, can you share the file? Sorry it’s not in Excel. In case this is useful, here’s a page which shows photos of all the sculpt types in A&A 1941 (http://www.axisandallies.org/p/axis-allies-1941-preview-unit-details-and-abilities/) along with a list of how many sculpts of each type are in the game. Clicking on each picture will give you an enlarged version. @DiscoKnekt: Nice table! Really like the NO cards! We have a problem that people tend to forget what NOs they have so we need some kind of reminder, maybe this is solution! Is there any chance you could share the file for the cards so that i save some time typing them? My NO card deck will be available soon, I will let you know by PM how you can get one when they’re ready. It goes like this. Have a war for a few years, play Acquire for a few decades, then have another war. The time of course is relative and scale down for the game. Each game should take just over a month.